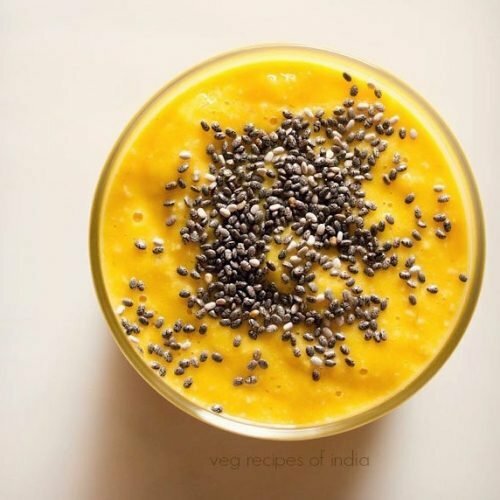 mango oats smoothie recipe - 3 ingredient smoothie made with overnight oats and mangoes. soak quick cooking oats or rolled oats in water. mix well. cover the bowl and keep in the fridge overnight or for 7 to 8 hours. next day, chop 1 large mango and add the mango cubes in a blender. blend till smooth. this is a thick smoothie. to thin down a bit, you can add some water or milk. pour in a glass. you can top with dry fruits or seeds or berries. for some crunch, i sprinkled chia seeds. you can easily skip chia seeds. - add sweetener of your choice, if you prefer.